Picture provided by Bianca Garcia. I grew up eating torta. I ate it for breakfast, lunch, or dinner, always served with fluffy white rice. Torta was one of my family’s go-to dishes, made with simple ingredients that even picky eaters would appreciate. It’s essentially a round omelette with ground pork, onions, and potatoes. It is sometimes referred to as “tortang giniling” (giniling = ground) because it is made with ground meat, typically pork or beef. This distinguishes it from different versions of torta. 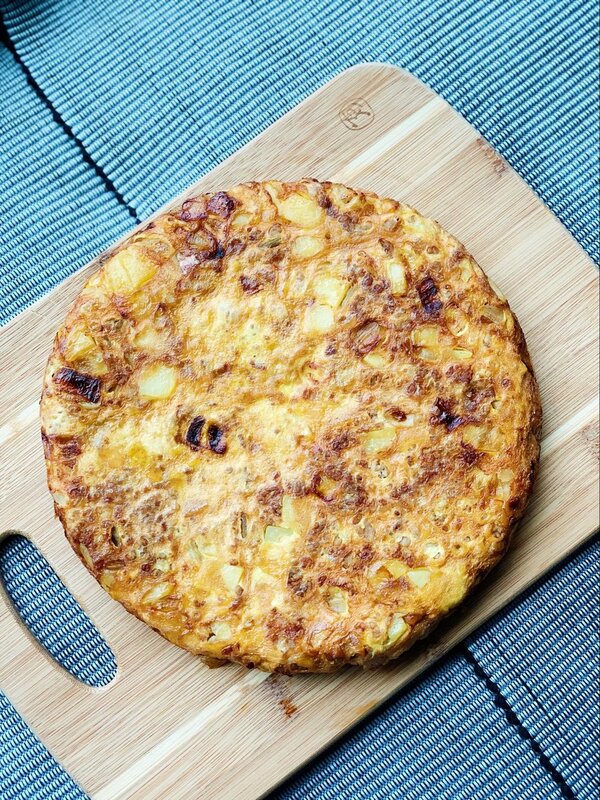 For instance, there’s “tortang talong” (talong = eggplant). There’s “tortang gulay” (gulay = vegetables), that’s made with different veggies like squash, bittermelon, cabbage, etc. There’s also a dish that is a combination of the above: tortang talong (eggplant) stuffed with ground beef. That dish is called a rellenong talong (relleno refers to anything that is stuffed) but then we are going on a different topic, and I’m here to talk about torta. Specifically ground pork torta. The torta we eat at home in the Philippines is made painstakingly by my Tita Ine. 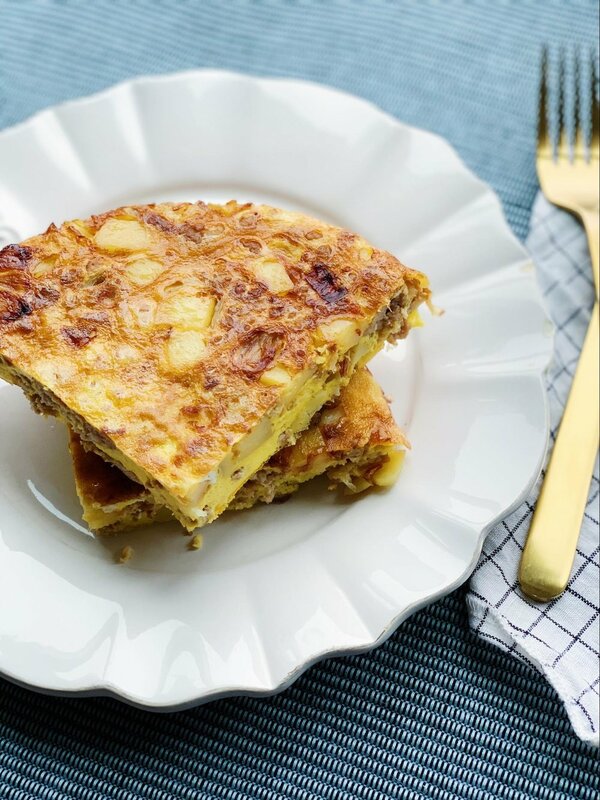 It has teeny tiny cubes of uniformly cut potatoes that mingles seamlessly with the juicy ground pork, all in a delicate frittata-like casing, flavored simply with white onions and salt (never pepper). She cooks the ground pork first, then the potatoes and onions, adds in eggs that have been whisked into submission, and then flips the entire pan into a plate, and transfers it back to the pan to cook the other side. I’ve tried many times to recreate her recipe and follow her instructions, but it never turns out the same because 1) my knife skills are not great / I don’t have the patience to cut teeny tiny cubes of potatoes, 2) my flipping skills need work (there’s been more than one occasion of a torta gone wrong), and 3) I always seem to overstuff my torta and it doesn’t exactly come out as a delicate piece of art. So I decided to make my own, easier, non-intimidating version. I made a few updates: 1) I roughly chop the potatoes into half-inch cubes, 2) I bake the torta, which saves me the stress of flipping it, and 3) I use a deep dish pan so even if it’s overstuffed, things don’t spill out of the pan, and instead it comes out as one big sturdy-looking frittata. Below is my own recipe, which my husband and I make at least every other week. It has the same flavors as the torta I grew up with, and it still goes very well with white rice. But it also goes well with an arugula salad, or a sandwich (with a little smear of mayo, yum), or just eaten by itself. I like dipping it in ketchup, but some people like fish sauce or soy sauce. On the stovetop, heat olive oil in a large oven-safe pan over medium-high heat (you can use a cast iron skillet or a non-stick pan). Add ground pork. Stir often and break up clumps with a wooden spoon. Cook until browned, about 10 minutes. Season with salt. Remove pork from pan and set aside. Reduce heat to medium. Add potatoes and cook for about 3 minutes, and then add onions. Cook until onions are translucent and potatoes are soft. Beat the eggs with a generous pinch of salt. Add eggs to pan. Let sit on stovetop for a minute or two, until edges start to set, and then transfer to oven. Bake for 12-15 minutes, until eggs are set. Slice into wedges and serve. I know that torta could mean different things for different cuisines: it could be a Mexican sandwich, a Spanish flatbread, an Italian cake, a Brazilian pie. But to me, it’s an egg concoction with ground meat and veggies. To me, it has always been Tita Ine’s torta. And now, it’s mine, too. We’re always looking for BOSFilipinos blog writers! If you’d like to contribute, send us a note at info@bosfilipinos.com. Fun fact: growing up I went to library school instead of preschool, so I started reading at a very early age. And while other kids’ favorite games were Candy Land or Mouse Trap, my favorite game was Dewey Decimal Classification Bingo. 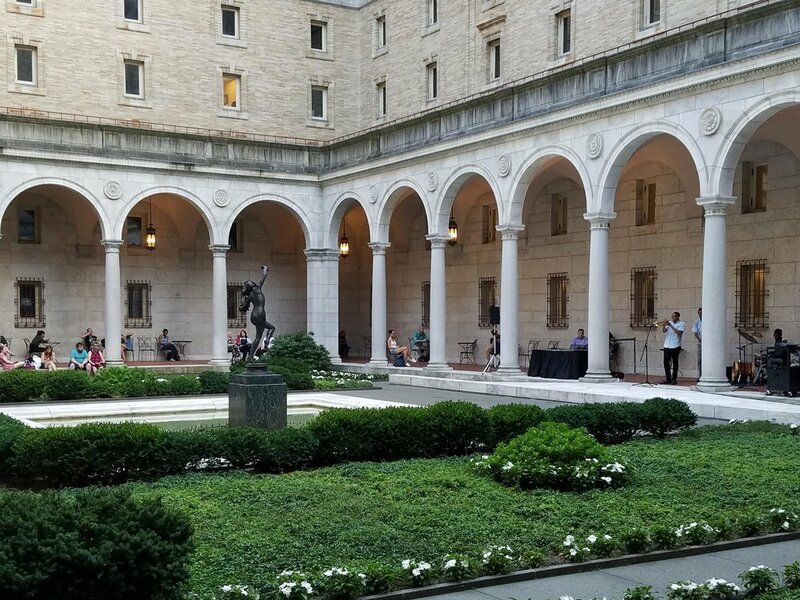 So it’s probably no surprise that when I moved to Boston I quickly fell in love with the Boston Public Library. 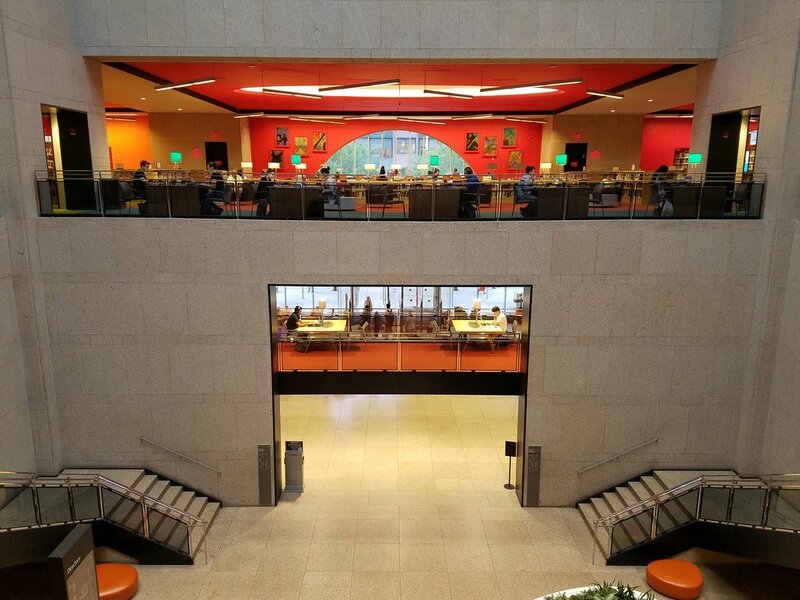 Now that I’m a consultant, I spend even more time there, and it’s one of my favorite places in the city by far. Another reason I love the BPL is because of the number of Filipino books it has on the shelves. I’ve gotta admit, I was initially drawn to this book because of the title. I regularly call older family members The Elders Council because they are the last say on important decisions that impact our very large family (dates people can get married, when reunions are, etc). In this memoir, Poblete talks about the intergenerational issues she experienced growing up Filipino American and living with her immigrant grandparents. 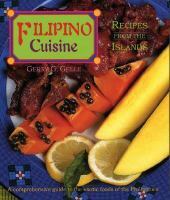 This is one of the larger Filipino cookbooks available at the BPL, with hundreds of recipes from different parts of the Philippines like Northern Luzon, Central Plains, Bicol, Visayas, and Mindanao. 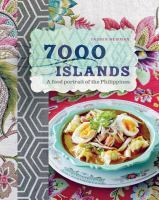 So if you’re looking for a cookbook that’s a general overview of Filipino cuisine, this one’s definitely it! 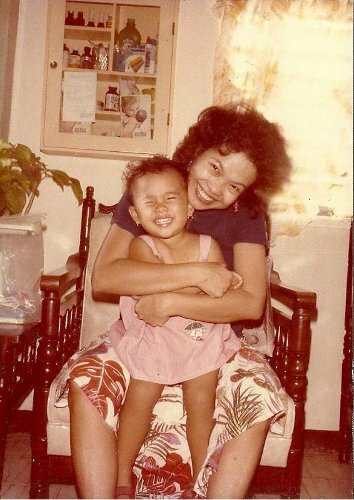 Growing up in America, most of my bedtime stories were about my dad’s farm in the Philippines. So while my favorite stories are of Filipino origins, I’ve actually never heard Filipino retellings of classic folktales. In this book, Roulo compiled 13 stories, some of which have companion tales in other cultures. Bonus: Romulo’s book Filipino Friends is also available at the BPL! The 2nd edition of this book is available at the BPL. 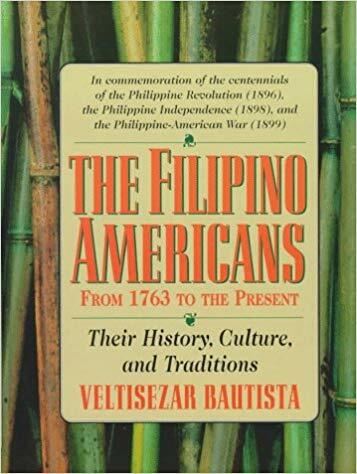 As Filipinos are not generally credited for their contributions in America, I found it fascinating that in reading this book’s description, it covers everything from the economy, politics, entertainment, and more. This book covers oral histories of First to Fourth Generation Americans from China, Japan, India, Korea, the Philippines, Vietnam, and Laos. I love that it features AAs from all these different countries and differentiates some of their experiences. I feel like people often forget how much of a blanket term “Asian” is, and how different we all can be from hair / skin color to cultural and religious traditions. Admittedly, this isn’t a book on my Later shelf, I have this book checked out right now… but I promise to return it soon! So far I’ve made mango icebox cake, flan, and empanadas. I love Newman’s take on a cookbook as a cultural guide, and her notes on the origins and influences on each recipe. What are your favorite Filipino books at the BPL (or locations across the city)? How about books that should be at the BPL and aren’t? Comment below! We’re always looking for BOSFilipinos blog writers / subjects! If you’d like to contribute or have a suggestions, feel free to send us a note: info@bosfilipinos.com. Continuing our May celebration of mothers, I want to talk about my mom, Celia. She is my most influential food guides. She has always been the first one to introduce me to different tastes and flavors from all over the world. I learned to love food because of her, and as fate would have it, I now have a food blog where I can share my favorite foods with the world, too. It all started when I was still in utero, and my pregnant mom was constantly craving and eating kesong puti, the milky white cheese that’s native to the Philippines. It’s essentially buffalo mozzarella, but creamier and fresher. According to Filipino superstition, my mom’s pregnancy craving was the main reason why I myself developed a lifelong longing for kesong puti. My mom is the one who taught me to love sardinas (sardines), the Spanish or Portuguese kind, in oil and spices. 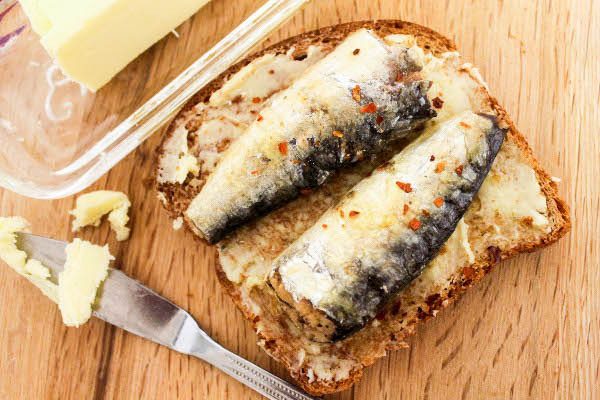 I love these little sardines (that still have skin and bones), on top whole wheat bread, toasted dark, slathered with creamy butter. 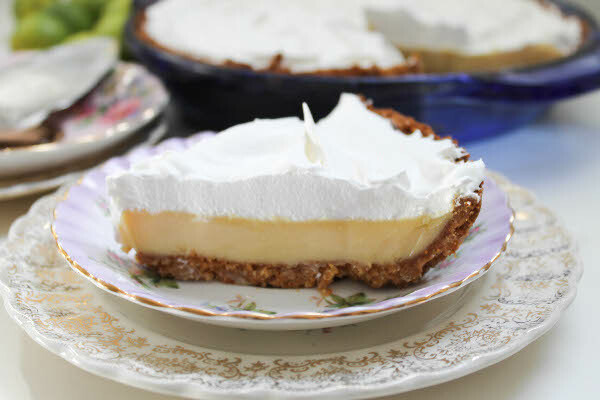 My mom loves key lime pie, and (surprise!) so do I. Key limes are smaller than regular limes, with a more yellowish skin, instead of bright green. They are very similar to Filipino calamansi. I would juice a million key limes by hand for my mom! My mom cannot turn down anything “turtle” flavored - chocolate, caramel, pecans. 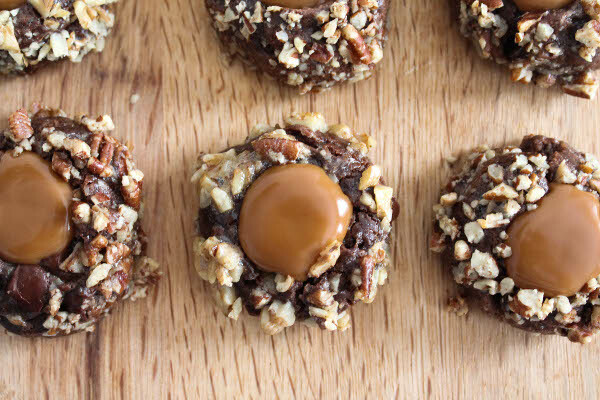 These little turtle cookies are a nice little treat. Like me, she enjoys dessert. But unlike me, she’s typically content with smaller portions (ha!). 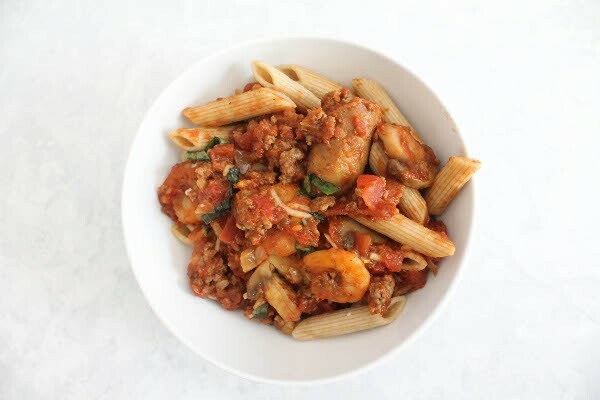 Her faith in my cooking also helped me finally recreate her famous pasta sauce, which is like a mixture of a bolognese with a surf and turf plate. It’s a meat-lovers sauce (ground beef + bacon + Italian sausage) with big juicy shrimp. It’s as mouth-watering as it sounds. When I see any kind of citrus marmalade - orange, lemon, grapefruit - I immediately think of my mom. And when I see a breakfast treat or pastry studded with nuts - almonds, pecans, walnuts - I think of my mom as well. 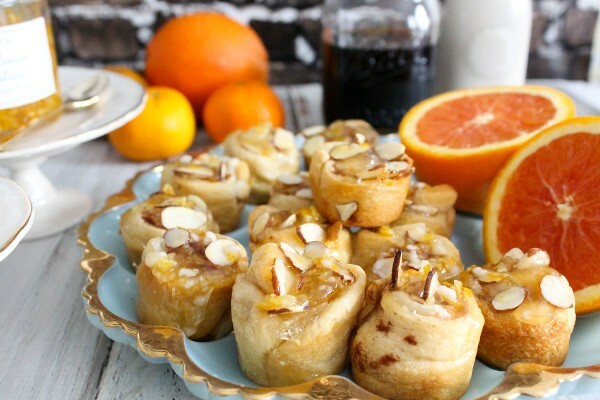 I wanted to make a citrusy breakfast inspired by her favorite flavors, and landed on little cinnamon buns with almond paste, slivered almonds, and Meyer lemon marmalade. Meyer lemons, by the way, are like a cross between a lemon and an orange. They’re sweet and not as tart as their more ubiquitous cousins. They’re also smaller with a thinner skin that has a slightly more orange tint, and they come into season during mid-winter to late spring. They remind me of Filipino dalandan. Even though I’m a woman in my thirties, I am not exactly adept at eating crab, one of my favorite seafoods. That’s because whenever I’m home or with my parents, I turn into a child and ask my mom to do the work for me. Shell the crab, pick the meat, open the claws – the whole show. She’s just so adept at it! (And I’m too lazy.) 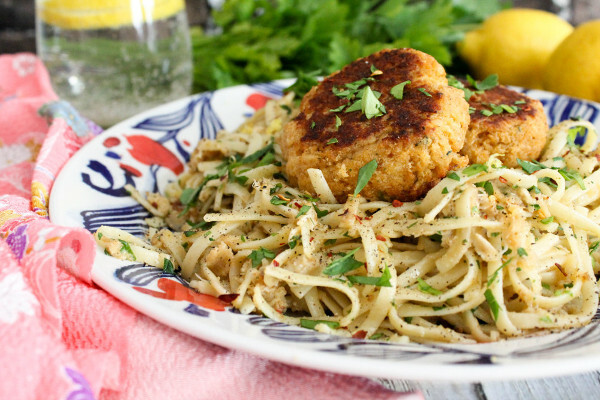 My mom and I both love crab cakes, so I made this easy but luxurious-tasting linguini with crab cakes. 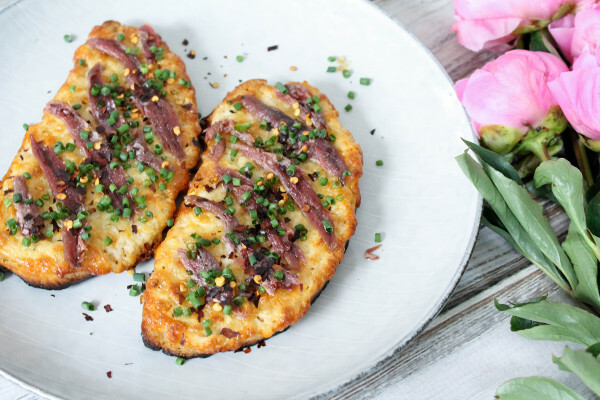 Last but not least, since my mom was the one who influenced my love for anchovies and all things cheesy (melted cheese, snacking cheese, cheesecake, cacio e pepe - if it has cheese, give it to me) I recently made this anchovy toast. Crunchy bread, garlicky cheese spread, and salty anchovies, finished with a shower of chopped chives and red pepper flakes. The flavors are unapologetically strong, not for the fainthearted, and perfect in every way. I hope I was able to inspire some of you to make something delicious and enjoy it with your mom and loved ones! I’ve made these mini ensaymadas several times already and they’re always a hit! I’m sharing my recipe for you to try out and maybe bring to your next holiday party or salo-salo (social gathering). Ensaymada is Filipino pastry. It’s a soft, buttery, brioche-like bun topped with butter, sugar, and cheese. Some versions (like mine) use buttercream, some use margarine, and some even omit the cheese altogether. But if you know me, I never omit cheese from any recipe. For most Filipinos, ensaymada is a big part of the holiday season, ubiquitous at parties and potlucks. But it’s not only available during the holidays; it’s enjoyed year-round. 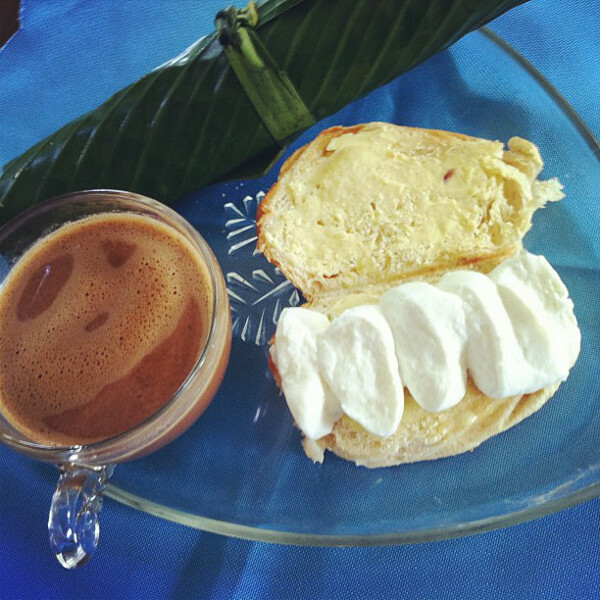 Ensaymada is also a staple for breakfast, merienda (mid-morning or mid-afternoon snack), or dessert. And it is often served with coffee or tsokolate (hot chocolate). 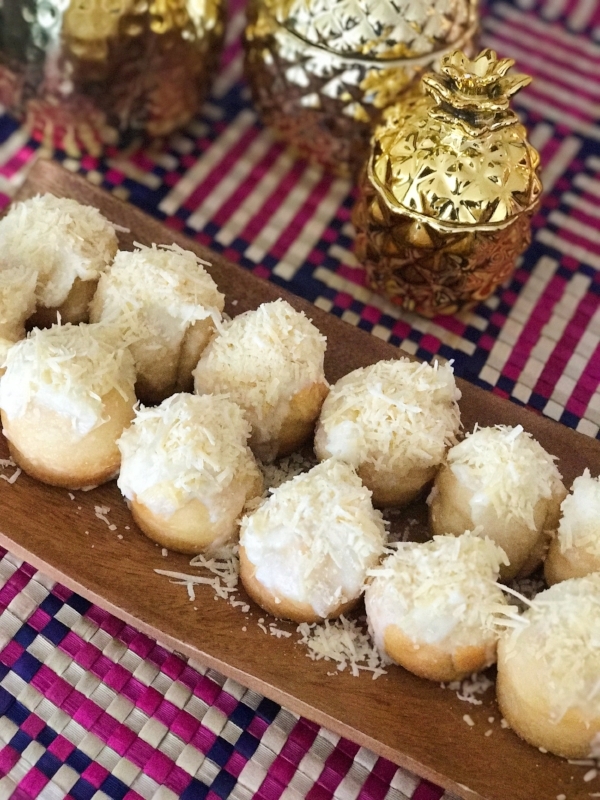 The cheese that’s typically used to top ensaymada is queso de bola, a special kind of edam cheese that’s manufactured only for the Philippines, and available during the holidays. I used a micro-plane to shred the queso de bola, resulting in extra fine shavings that I then used to generously blanket the top of each pastry. Queso de bola is hard and crumbly, similar to Parmesan, so if you don’t happen to have a ball of Filipino cheese within easy access, you can always substitute parmesan. You can also use sharp cheddar cheese. I used a shortcut in this recipe by using pre-made dough in the form of crescent rolls. This saves a lot of time, and it makes the recipe more accessible and less intimidating for me. If you’d like to make the dough from scratch, I like this recipe by Jun-Blog. Unroll dough. Separate into 2 rectangles. Most crescent roll dough includes 8 triangles, so for this recipe, each rectangle will be made up of 4 triangles. Pinch the perforations together. Flip over and pinch the perforations on the back together, too. Use a rolling pin to smooth out the seams and flatten the dough a little bit. Brush the rectangles with melted butter, and roll each rectangle into a log. Cut each into 8 pieces, so you'll end up with 16 pieces total. Using a pastry brush, grease mini muffin tins with the remaining melted butter. Insert buns and bake for 11-12 minutes. While buns are baking, make the buttercream. In a medium bowl, combine the room temperature butter and confectioners sugar. Cream together until smooth. Once buns are lightly golden, remove from oven and let cool for 15 minutes. Spread buttercream on top of each mini bun and generously top with cheese. Serve immediately or keep in an airtight container.